Chief Oren R. Lyons is a traditional Faithkeeper of the Turtle Clan, and a Member of the Onondaga Nation Council of Chiefs of the Six Nations of the Iroquois Confederacy, or the Haudenosaunee (“People of the Long House”). He is Professor of American Studies at the State University of New York at Buffalo, where he directs the Native American Studies Program. 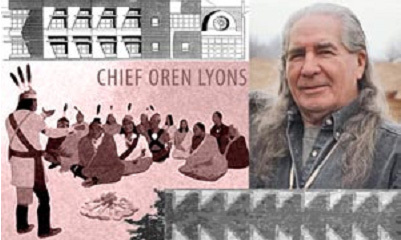 Oren Lyons was raised in the traditional lifeways of the Iroquois on the Seneca and Onondaga reservations in northern New York State. After serving in the Army, he graduated from the Syracuse University College of Fine Arts. He then pursued a career in commercial art in New York City, becoming the Art and Planning Director of Norcross Greeting Cards with 200 artists under his supervision. He has exhibited his own paintings widely and is noted as an American Indian artist. Since his return to Onondaga, Chief Lyons has been a leading advocate for American Indian causes. He is recognized not only in the United States and Canada but internationally as an eloquent and respected spokesperson on behalf of Native Peoples. He is internationally renowned as an environmental and human rights advocate, and sought for his expertise on American Indian traditions, Indian law and history, and interfaith dialogue. For over fifteen years, he has taken part in the meetings of Indigenous Peoples held in Geneva under the auspices of the Human Rights Commission of the United Nations, and helped to establish the Working Group on Indigenous Populations in 1982. He serves on the Executive Committee of the Global Forum of Spiritual and Parliamentary Leaders on Human Survival, and is a principal figure in the Traditional Circle of Indian Elders, an annual council of traditional grassroots leadership of the major Indian nations of North America. Chief Lyons was a negotiator between the governments of Canada, Quebec, and New York State and the Mohawk Indians in the crisis at Oka during the summer of 1990, and led a delegation of seventeen American Indian leaders which met with President Bush in Washington on April 16, 1991. Chief Lyons was the subject of a one-hour television documentary produced and hosted by Bill Moyers, which was broadcast on PBS. In 1992, he organized a delegation of the Iroquois Confederacy to the United Nations Conference on Environment and Development in Rio de Janeiro. Chief Lyons is co-editor (with John Mohawk) of Exiled in the Land of The Free, a major study of American Indians and democracy. A lifelong lacrosse player, Oren Lyons was an All-American in this sport, which was invented by the Iroquois; the Syracuse University team had an undefeated season during his graduating year. (NFL Hall of Fame running back Jim Brown was a teammate and fellow All-American on the Syracuse lacrosse team.) He is currently Honorary Chairman of the Iroquois National Lacrosse Team. In 1993, he was elected to the Lacrosse National Hall of Fame. Chief Lyons is the recipient of numerous honors and awards, including the Ellis Island Congressional Medal of Honor; the National Audubon Award; the Earth Day International Award of the United Nations; the Elder and Wiser Award from the Rosa Parks Institute for Human Rights; as well as an Honorary Doctor of Law from Syracuse University.